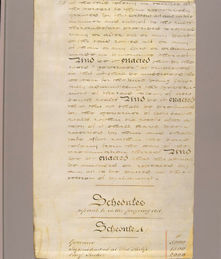 This document is an assent original of the Act which is the 'germ' of Australia's parliamentary system. It created Australia's first semi-representative legislature, and while it did not grant full responsible government, it was an acknowledgment on the part of the British authorities of the maturity of colonial society. 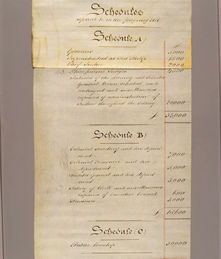 A Legislative Council had been established by the New South Wales Act 1823, but it consisted of nominated members only. This form of government only briefly satisfied the demands of the Colony as it emerged from its penal origins. The 1842 Act established a Legislative Council consisting of 36 members, 12 of whom were appointed by the Queen (on the advice of Her Ministers) and the rest elected by the voters in New South Wales. Eligibility to vote was based upon ownership or occupation of property set at a high value. 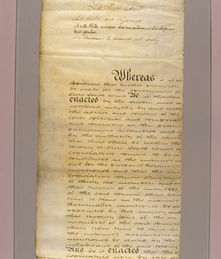 The Act did not establish 'responsible government' as the Governor still had overriding authority and Ministers of State were not Members of Parliament. 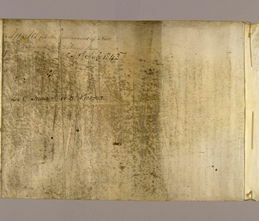 Handwritten on membranes of vellum, sewn end-to-end and then rolled. The vellum is in creamy shades and the ink is brown. 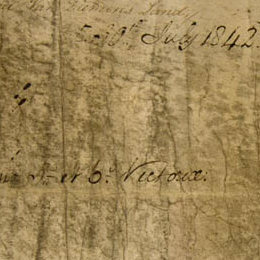 Detail from the front cover of the New South Wales Constitution Act 1842 (UK).